Make this Valentine’s Day your soulful journey towards greatest love by sharing what’s the best for both parties. Nothing can turn out as romantic as a candlelight dinner. Let the experts serve both of you as king and queen on this special day. 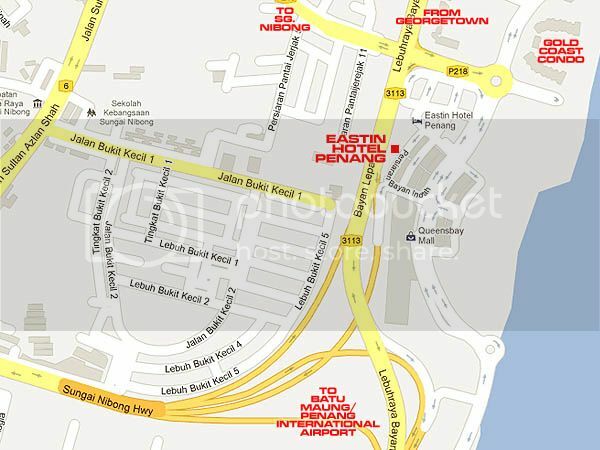 Let yourself enjoy all the romantic and precious moments you have together. 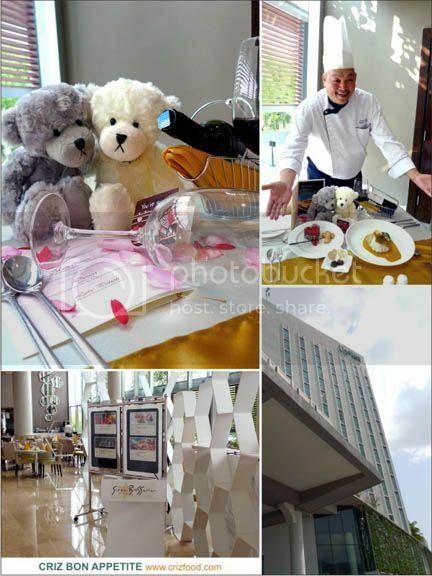 Let Swez Brasserie @ Eastin Hotel Penang, offer you the ultimate ardent indulgence of a delectable Valentine’s Day Set Dinner at RM198++ per couple while being serenaded by sentimental music on this romantic evening. Other than getting a beautiful and fluffy pair of imported teddy bears, you would be complimented with either a glass of red wine or mocktail. 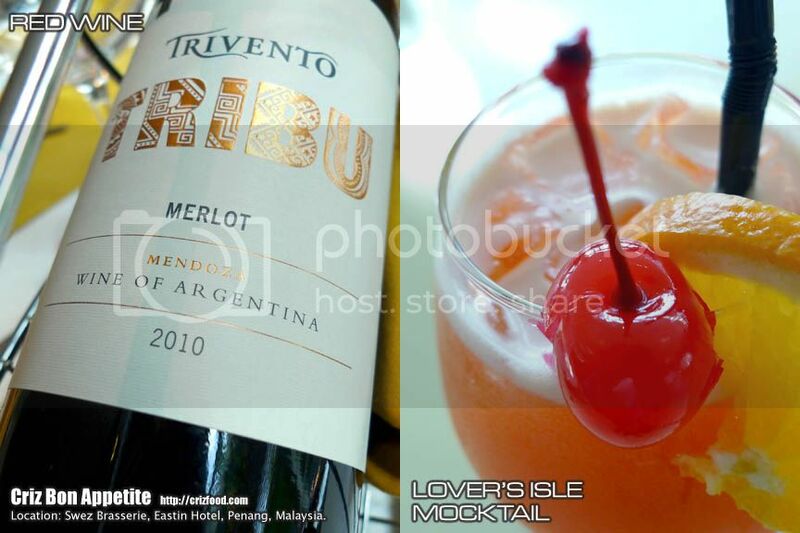 You have the option to choose the Argentina produced Merlot 2010 red wine or Lover’s Isle mocktail. The mocktail would consist of a concoction of pineapple juice, orange juice, mango juice with grenadine syrup. 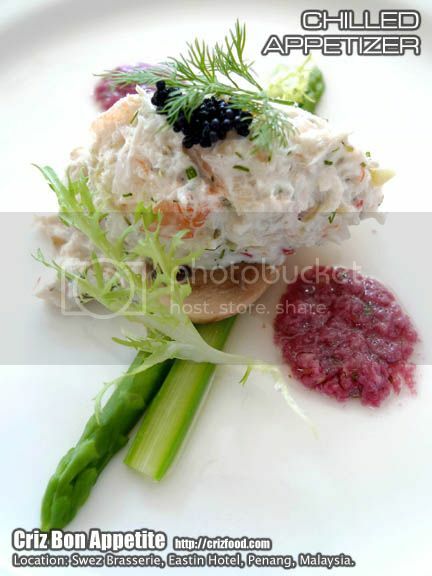 As for Appetizer, you would be served with Chilled Ocean Tartar with Pickled Mushroom, Asparagus and Beetroot Dressing. The freshly peeled crab meat, chopped prawns, onions, parsley with a hint of chopped red chilies all mixed up in some tartar sauce was a great seafood experience. This concoction was topped on some vinegar picked button mushroom slices and blanched asparagus, garnished with some black colored sturgeon caviars and served with some beetroot dressing. The beetroot dressing had a hint of chopped onions, vinegar and sugar. The taste was simply refreshing when combining a bit of everything in the mouth. This appetizer with a tad of creaminess, sweetness and sourness sure boosted up my appetite for more dishes to come. 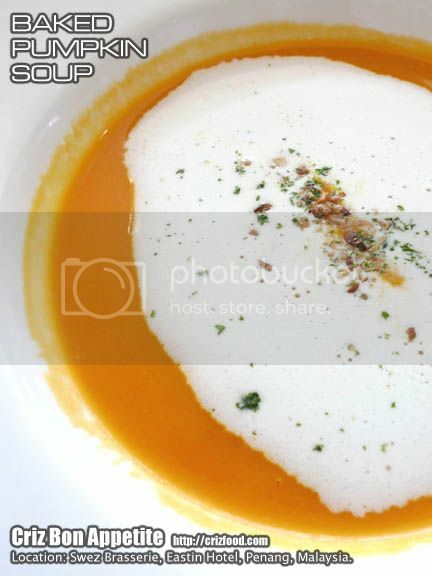 As for Soup, we were served with the Oven Baked Pumpkin Soup with Crispy Pumpkin Seeds. One sip and you would realize that it was not simply done. The soup had that sweetness not only from the baked pumpkin but also from some thick vegetable stock. Combined with the creaminess from the whipped butter cream and coarsely crushed roasted pumpkin seeds, it was indeed my perfect kind of soup. You can get the waiter to grind in some black pepper for that extra peppery flavor. As for the Main Course, it was either fish or chicken. 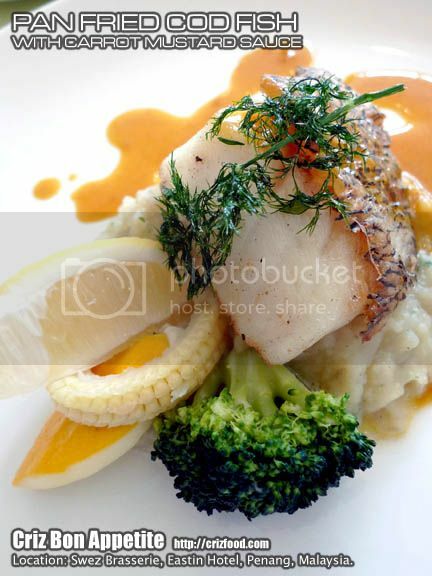 We were first served with Pan Fried Cod Fish on Sweet Potato Puree with Carrot Mustard Sauce. For fish lovers, this dish would indeed suit you well. It was a thick slab of cod fish, mildly herbed, salted and pan fried to perfection with the juiciness still locked within the fillet. With a little twist of some lemon juice, a small scoop of the sweet potato puree and a little dab on the carrot mustard sauce, it was a mouthful of freshness. The next main course option was the Baked Chicken Wellington with Spinach and Gravy. Well, I did fell in love with the Baked Beef Wellington dish once at the Swez Brasserie and this dish was done just as good as the other. 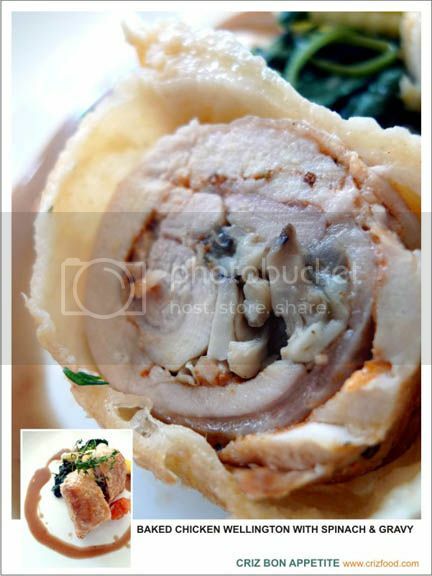 The preparation of this poultry dish was somewhat quite similar to the chicken cordon bleu with rolled up chicken fillet. Instead of having ham and cheese rolled up and coated with breadcrumbs prior to deep frying, this dish had a sprinkle or two of paprika, chopped onions and mushroom rolled up and wrapped in puff pastry prior to baking. It went well with the accompanied brown sauce and sautéed baby spinach with chopped garlic. The Dessert truly would express your love for each other significantly with the Endless Love being served. 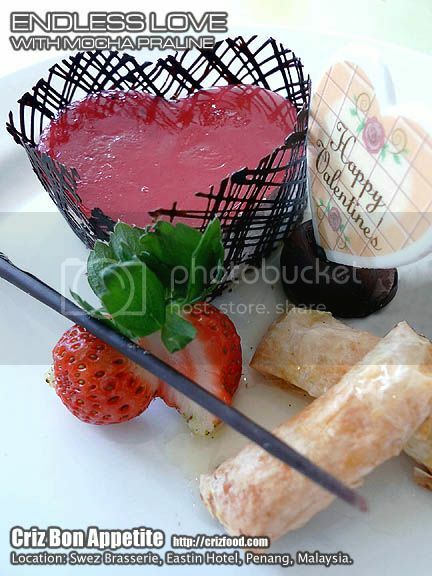 It had a chocolate fenced up heart shaped strawberry mousse served with two mini jackfruit filo pastry wraps with clear vanilla sauce, a strawberry and a chocolate stick. You would also get a Valentine’s Day Mocha Praline on that day. It was a simple dessert to me but was very well presented.